Multiple prick tests performed at once can help identify potential allergens. A prick test is often used by allergists when a patient has clear allergy symptoms but is not certain which food or other substance is causing those symptoms (or whether the symptoms are caused by a food allergy or other type of allergy at all). Skin prick tests are often used when patients have hives, eczema, or hay fever symptoms. Prick tests have a number of advantages. They're among the quickest allergy tests available—you can perform them and get results in about 20 to 30 minutes. They also are reasonably inexpensive. They allow allergists to test a number of potential allergens at one time, as well—your allergist may be able to test for three dozen or more allergic substances with one skin prick test session. Finally, skin prick tests are usually not painful, even though they involve a series of pricks on your skin. They do have some disadvantages, however. 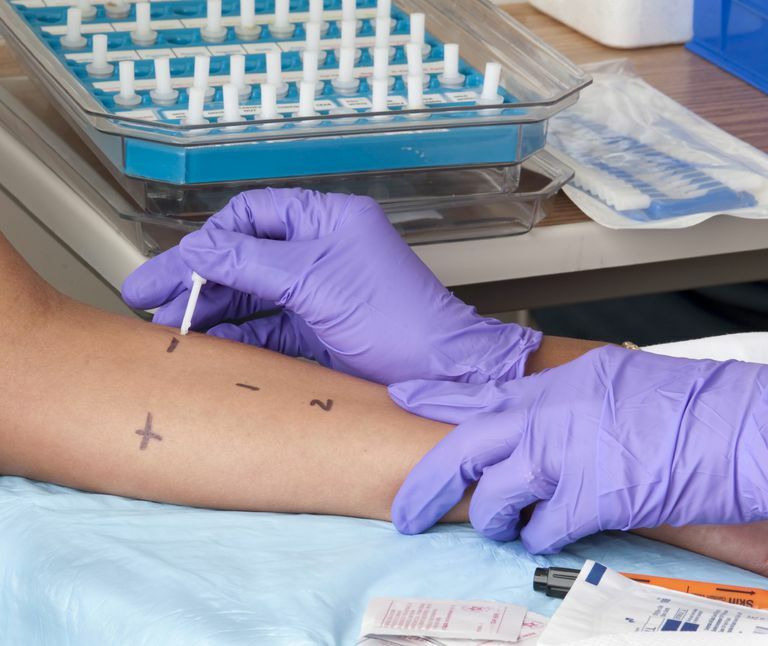 Prick tests are considered less sensitive than some other allergy tests, and a negative prick test may be followed up with other, more sensitive tests if a practitioner strongly suspects an allergy. Prick tests are generally not used when a reaction is considered life-threatening. "False positives," where a food someone tolerates well returns a positive test result, do occur. An allergist will make a final diagnosis of an allergy based not just on the prick test, but also on the patient's symptoms and history. Prick tests (sometimes called scratch tests) are performed on the skin of your forearm or your back. Allergists put a small amount of an extract of a potential allergen into a shallow scratch, using a plastic needle or sharp probe (it feels a bit like someone scratched you with their fingernail). This type of testing is efficient: It's possible to test for multiple allergies at once since each one can be tested with its own scratch. In addition to food allergies, prick tests can look for allergies to pet dander, dust, mold, and pollen. If your doctor decides to use skin prick tests to diagnose your allergies, you should expect to spend an extended time at the office. The practitioner who administers the test will draw lines on your skin to delineate the different prick marks, and then will use clean needles to prick your skin with a tiny drop of each allergen used for the testing. Within 20 to 30 minutes, a positive result will show as a hive, or wheal, on the scratch. The size of the hive may correlate with the intensity of the allergic reaction. Reactions may feel a bit like a mosquito bite. You may also find that the wheals itch. The entire test is performed while you stay at your doctor's office. In the event you have a severe reaction to the prick test, your allergist will administer a rescue medication such as epinephrine or an antihistamine. Severe reactions to a prick test, however, are uncommon. How Accurate Are Prick Tests? Negative results are fairly accurate: if you don't react to the prick test of a suspect food or substance, it's unlikely you're allergic to it (although your physician may still follow up with more sensitive testing). However, false positives on skin prick tests are much more common—they occur half the time or more, in fact. So a positive result on a skin prick test should always be coupled with careful analysis by your allergist to determine whether it's indeed a true result, or if it's a false positive. In addition, if your allergist suspects that you have an allergy that's potentially life-threatening, she most likely will not use a skin prick test to diagnose it. That's because blood tests are much less likely to provoke a life-threatening reaction than a skin prick test. These medications all work by reducing your reactions to allergens, and so they may reduce the chances that you will form a wheal in reaction to an allergenic substance. If you're taking any of these medications, let your doctor know prior to your testing date. Food Allergy Research & Education. Skin Prick Tests fact sheet. U.S. National Library of Medicine. Allergy Testing fact sheet. Could Your Odd Symptoms Mean You're Allergic to Citric Acid?